How to guide your students to self-differentiate their homework—without creating more work for yourself. If you’re assigning the same homework to all of your students, you may not be helping them reach their full potential. Consider this scenario: Marly and Evan are in the same math class, but they’re having very different experiences with homework. Marly completes most of her work in a few minutes. After all, she already knows how to divide fractions. Evan, however, spends an hour and a half struggling through work he doesn’t understand. After several meltdowns (by both Evan and his mother), he finishes. He’s still not sure if he’s on the right track. This scene is, of course, nothing new. We know that one-size-fits-all homework doesn’t work any better than undifferentiated classwork. In fact, it’s usually worse, since there’s no teacher around to help. Yet there’s no way that teachers have time to create multiple homework assignments, tailored to the needs of each student. Fortunately, there’s a way we can offer students more appropriately differentiated learning tasks for homework while not crushing ourselves with work. The key is to share some of the responsibility for and control over homework with students. Teachers help guide students and set up open-ended possibilities. Students then choose the best personal fit, self-differentiating their work. 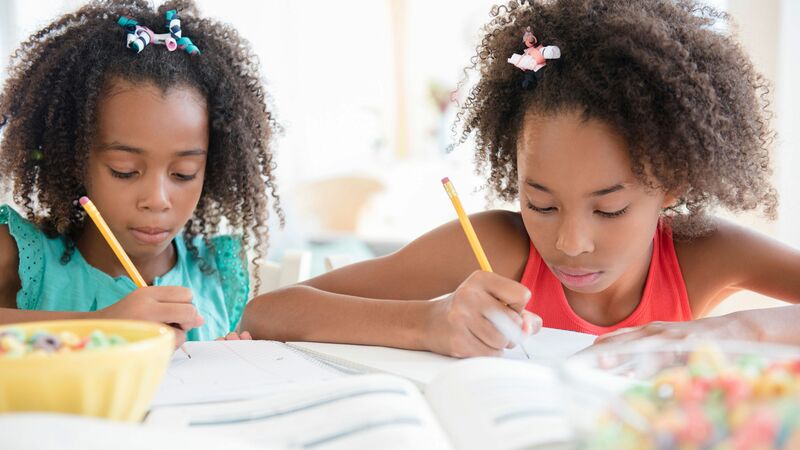 Before we dig into how we can use choice as a vehicle for differentiated homework, let’s first be clear about a few principles of effective homework in general. Focus on reinforcement. Use homework to practice and review skills learned in class. Students should be able to do homework independently. Keep homework skill-based, simple, and brief. Big projects and work requiring complex thinking belong in school, where skilled teachers can guide and support students’ learning. Keep homework review light. When homework is about practice and reinforcement, there’s no need to spend lots of time correcting or assessing it. Especially when homework is more individualized, it makes less sense to go over assignments in class. Instead, you might have students circle one example they want you to look at, or they might each share an example they tried with a partner. Structure homework around time, not quantity. Instead of assigning all students the same number of examples to complete, assign all students the same amount of time to work. For example, instead of requiring all students to complete 10 multiplication problems, you might have all students practice multiplication for 15 minutes. In a typical model of differentiation, teachers create multiple activities and group students according to their needs, abilities, or interests. This puts unrealistic demands on teachers and is imperfect at best—some students still end up working on assignments that are too hard or too easy for them. Instead, we can offer students choices about their work, and help them learn how to choose appropriately challenging work for themselves. For example, instead of assigning the same 20 problems to all students, Marly and Evan’s teacher could have said, “Spend 15 minutes practicing some problems tonight. You may use the ones on page 113, or you can make up some of your own. See if you can find or create problems that give you a little bit of a challenge but that you can still solve independently.” In this way, both Marly and Evan could meet their needs as learners—spending more time in their just-right learning zone. This can be especially beneficial for struggling students like Evan, since he’ll get the practice he needs to gradually solve harder and harder problems over time, instead of being frustrated and giving up early on. Teach students how to choose well. Brainstorm strategies as a class. Have students share ideas together. Create an anchor chart together. Practice choosing homework in class before students head home—don’t assume that students know how to choose well. Offer good choices. Make sure that options for homework focus on the skills being practiced and are open-ended enough for all students to be successful. Use resources you already have. Though offering choice might sometimes involve creating a couple of different resources, you might be able to use what you already have. Use the math book, reading anthology, or other textbook and give choices within that text. Ask students for ideas about homework. Students will often come up with great ideas for ways to reinforce learning at home. Simply ask the question, “What are some ideas for how you might practice this skill at home?” and see what they come up with. There are plenty of different opinions out there about homework, and John Hattie, among others, has shown that there are limits to its effectiveness. So let’s use it as an opportunity to share some power and control with students, helping them practice in ways that best meet their needs while also boosting their sense of agency and ownership about learning. To learn more about how to use choice to boost engagement and help students self-differentiate their learning, check out Mike Anderson’s Learning to Choose, Choosing to Learn.